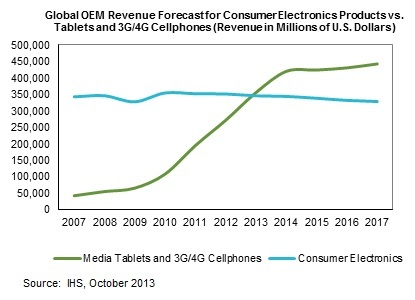 Smartphones and tablets are becoming biggest chunk of consumer electronics (CE) market. IHS finds the worldwide original equipment manufacturer (OEM) factory revenue for media and PC tablets and for 3G/4G cellphones amount to $354.3 billion in 2013, a 3 percent more than the $344.4 billion for OEM factory revenue for the CE market, a broad category that includes hundreds of product types, including televisions, audio equipment, cameras and camcorders, video game consoles and home appliances. The massive CE market historically has dwarfed the tablet and smartphone segment, with CE 30 percent larger just last year, says IHS. The below figure presents the IHS history and forecast of OEM factory revenue for all types of tablets and 3G/4G cellphones; factory revenue is defined as the total OEM dollar value of all branded devices or equipment in a market. The figure starts in 2007, the year that smartphone shipments surged due to Apple Inc.’s introduction of the first iPhone. The figure also presents the boom in revenue during 2010, the year that Apple kicked off the media tablet market with the introduction of the initial model of the iPad.